Saturday night Rob and Lindy dropped by and we sat on the porch until the mosquitoes drove us inside where we had tea. And air conditioning. Pilgrim and I were talking to Rob about aesthetics and music. Can a style be inappropriate apart from its content? Katie and Lindy were talking about Abraham. Sunday we had a church picnic at our house, with about 90 people. We borrowed a grill, set up tables and set out toys for the sand box. 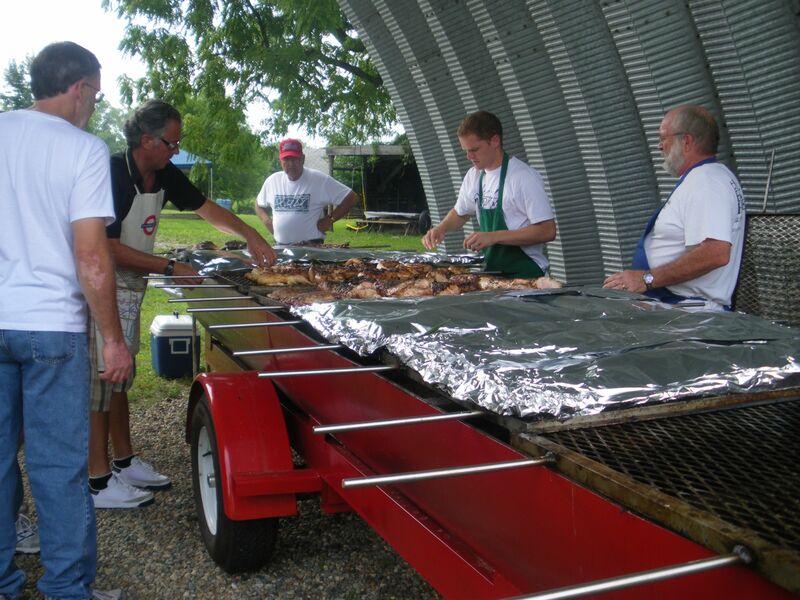 Actually, we borrowed a huge grill, one big enough to grill ten racks of ribs, six whole pork loin, ten chickens and two bushels of corn—all at the same time. We hardly talked to anyone we were so busy managing the event. We had an army of helpers, but still there are lots of details to keep track of. It isn’t easy to make things look simple. But it’s certainly rewarding to see lots of people relaxing on your front lawn. Part of genuine hospitality is not drawing attention to it, which is much more difficult when you are using a ten-foot, red grill you borrowed from the fire department. But there is an unobtrusiveness that accounts for the success of such events at any scale. Long ago Katie and I began to see that hospitality is much different from entertaining. It’s the difference between serving others and showing off. Of course some people will always feel uncomfortable when you focus on their needs. Some are uncomfortable both as givers or receivers of grace. But helping everyone feel comfortable is the goal, even if it’s not attainable. The end is at hand. As our lives become more stressed and more uncertain, we need each other more. We should all be about the work of sheltering each other, providing momentary sanctuary. But hospitality is about more than providing a place to hide; it’s about providing a place to regroup, refreshed and renewed. We draw strength from each other as we rest in the Lord. Hospitality is about creating such a place. We can’t do that if we are grumbling about it. We can’t do it if we aren’t doing it, either. Just slap me in the face, will ya? A slap can be an angry reaction or a revival action. I don’t think you’re angry with me and I don’t think you’d slap me if you were. But, without realizing it, you woke me up. You slapped some sense into me. I’ve been avoiding guests for several years. Why? Because I thought of it as entertaining … and work! I know how to serve; I don’t like to show off. This post was very hospitable of you because it provided me with a place of encouragement “to regroup, refreshed and renewed”. Thanks for the slap. It’s encouraging to me when I can help motivate people to do important things. Next Next post: hero or zero?